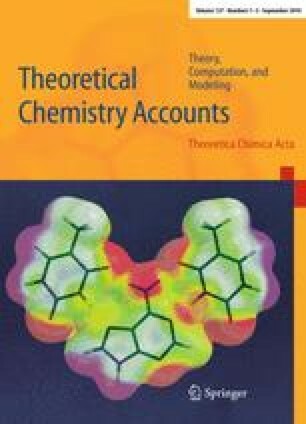 Density functional theory (DFT) has been used to study the solvolysis process of the organophosphorus compound P-[2-(dimethylamino)ethyl]-N,N-dimethylphosphonamidic fluoride (GV) with simple nucleophile [hydroxide (HO−)] and α-nucleophiles [hydroperoxide (HOO−) and hydroxylamine anion (NH2O−)]. The lowest energy conformer of GV used for the solvolysis process was identified with Monte Carlo conformational search (MCMM) algorithm employing MMFFs force field followed by DFT calculations. The profound effect was found for α-nucleophiles toward the solvolysis of GV compared to normal alkaline hydrolysis. Incorporation of solvent (water) employing SCRF (PCM) model at B3LYP/6-31+G* showed that solvolysis of GV with hydroperoxide (activation energy = 7.6 kcal/mol) is kinetically more favored compared to hydroxide and hydroxylamine anion (activation energy = 11.0 and 9.2 kcal/mol, respectively). The faster solvolysis of GV with hydroperoxide is achieved due to strong intermolecular hydrogen bonding in the transition state geometry compared to similar α-nucleophile hydroxylamine anion. Assistance of a water molecule in solvolysis of GV affects the activation barriers; however, the hydroperoxidolysis remains the preferential process. The topological properties of electron density distributions for (–X–H···O, X = O, N) intermolecular hydrogen bonding bridges have been analyzed in terms of Bader theory of atoms in molecules (AIM). Further, the analysis was extended by natural bond orbital (NBO) methods for the strength of intermolecular hydrogen bonding in the transition state geometries. This study showed that the reactivity of these α-nucleophiles toward the solvolysis of GV is a delicate balance between the nucleophilicity and hydrogen-bond strength. Solvation governs the overall thermodynamics for the destruction of GV, which otherwise is unfavored in the gas phase studies. The online version of this article (doi: 10.1007/s00214-009-0701-2) contains supplementary material, which is available to authorized users. Authors thank DAE-BRNS, Mumbai, India for financial support of this work. One of the authors M.K.K. is thankful to UGC, New Delhi, India for awarding fellowship.